Hippeastrelia is an intergeneric cross between Hippeastrum and Sprekelia. 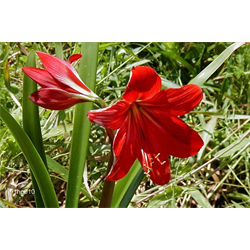 It has dark stems with an amaryllis-like flower in spring. Pricing is per each and per Hippeastrelia variety (quantity discounts apply). Buy flower bulbs online at Terra Ceia Farms!